Vanessa Miller of Dayton, Ohio, is a best-selling author, playwright, and motivational speaker. Her stage productions include: Get You Some Business, Don’t Turn Your Back on God, and Can’t You Hear Them Crying. Vanessa is currently in the process of turning the novels in the Rain Series into stage productions. 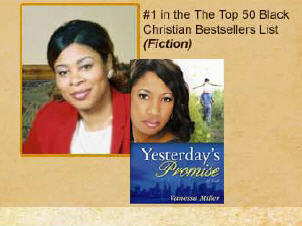 Vanessa’s latest release, Yesterday’s Promise, was #1 on BCNN April 2010 bestsellers list. View here. To date, Vanessa has completed the Rain and Storm Series. She is currently working on the Forsaken series, Second Chance at Love series and a single title, Long Time Coming. 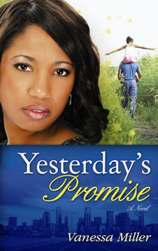 Yesterday’s Promise, a Christian romance, was released in April 2010 by Whitaker House Publishing. Vanessa believes that each book will touch readers across the country in a special way. It is, after all, her God-given destiny to write and produce plays and novels that bring deliverance to God’s people. These books have received rave reviews, winning Best Christian Fiction Awards and topping numerous Bestseller’s lists. •Black Expressions Book Club Alternate Selection 2007, 2008 & 2009. Vanessa originally self-published, then in 2006 she signed a five-book deal with Urban Christian/Kensington. Her books can now be found in Wal-Mart, and almost all major bookstores, including African American bookstores and online bookstores such as Amazon.com. Vanessa is a dedicated Christian and devoted mother. She graduated from Capital University with a degree in Organizational Communication. In 2007, Vanessa was ordained by her church as an exhorter. Vanessa believes this was the right position for her because God has called her to exhort readers and to help them rediscover their place with the Lord. Most of Vanessa’s published novels depict characters that are lost and in need of redemption. The books have received countless favorable reviews. BPM: Vanessa, introduce us to your book and the main characters. Yesterday’s Promise is a Christian romance about Melinda Johnson and Steven Marks. Melinda feels called to the ministry, but Steven doesn’t believe that women should preach. This disagreement between the two causes Steven to break off their engagement. But now, after ten years, Steven is back in Melinda’s life as the new bishop over her fellowship and he wants a second chance with Melinda. However, Melinda can never marry a man who doesn’t respect the call of God on her life. To love one another, the two must knock down the walls that separate them. But can the bishop finally do that for his lady or will Melinda be forced to leave Omega Christian Church? I loved Melinda’s character because she was so complex. She was a preacher with issues of unforgiveness that stemmed from broken promises that had been made by her mother, ex-fiancé and her father. She was an interesting character study. I enjoyed watching as she resolved her issues and gave love a second chance. Although Yesterday’s Promise is not about real people, it does deal with a real controversy in the Christian community. Not everyone believes that women should preach, but Melinda Johnson is determined to change minds and win souls. BPM: Where do you find your inspiration to write? I find inspiration for my novels in stories that I read in the Bible, conversations that I have with family and friends, or something that I watched on the news. I have awakened from dreams with the beginning of a storyline for a novel… inspiration comes from many different sources, but my main goal is to make sure each of my books glorify God. Since all of my novels a meant to lead the reader back to or closer to God, I believe my legacy will be that I spread the good news of the gospel with thousands upon thousands of people… and many of them found strength in the inspiration they found between the pages of my books. BPM: What specific revelation prompted you to write your book? I was doing a book signing at the Indiana Black Expo and the lady next to my table was signing copies of her book that talked about the struggle for women to preach. Since the bishop of my church is a woman and we have women preach at my church all the time, I had never thought anything about any struggle that women faced when it came to preaching. But then a man walked into the room where we were signing our books. He took one look at Pastor Notoshia Howard’s book and started screaming at her. He told her that she had no business trying to preach to men and that women were not allowed to preach. That’s when the idea of Yesterday’s Promise was dropped in my spirit. I wanted to write a book that details the struggles women who have been called by God have to deal with in order to preach the gospel. BPM: What are two major events taking place in the book? The major events in this book deal with Melinda’s struggle to preach. In several scenes she is forced to fight against her father and her ex-fiancé to prove that God has called her to preach. Yesterday’s Promise also deals with the issue of broken promises. Melinda struggles with this issue and finally allows God to heal her heart. Women between the ages of 35-65, Christian women and Christian women in ministry would enjoy this story of romance and ministry. BPM: How will reading your book shape the readers lives? I believe that Yesterday’s Promise will give readers a better understanding concerning women in the ministry and will also help them understand a little bit more about the benefits of forgiveness. BPM: What was the most powerful chapter in the book? Although there are many chapters in this book that will speak to the reader, in my opinion, chapter 22 is the most powerful because this is the chapter where Melinda learns to forgive. BPM: Ultimately, what do you want readers to gain from your book?I want readers to close the book on Yesterday’s Promise believing in themselves and in love again. Sometimes the world beats us up so much that we put aside the things we know we should be doing, in order to do the things that make the most sense – but if God called you to it, He will bring you through it. BPM: What do you think makes your book stand out?Although Yesterday’s Promise is Christian romance, it is one of the first romances to address the issue of women in the ministry. So, I believe that readers will find that aspect of the book interesting as well as the romance between Melinda and Steven. My web address is: http://www.vanessamiller.com my facebook page is: www.facebook.com/vanessamiller01 or readers can check out my Facebook fan page by typing in Vanessa Miller. Book clubs and ministry groups have been a lifeline for my novels. Therefore, I am constantly trying to think of ways to say thank you for your continued support. I have begun a new contest for the release of my new novel, YESTERDAY’S PROMISE and this contest is only for book clubs and ministry groups. YESTERDAY’S PROMISE releases April 6, 2010. I would like for your book club or ministry group to add Yesterday’s Promise to your April, May or June reading list. 1. Group entered into a drawing to receive book discussion and dinner w/Vanessa Miller – you bring the questions and I’ll pay for the dinner. 2. Group entered into a drawing to receive FREE T-shirts with all my 2010 books on the T-shirt. To be entered into the drawing all you need to do is email a few details to: vmiller-01@earthlink.net. Vanessa will need to know: Book club name, number of members, date you plan to discuss YESTERDAY’S PROMISE, city/state and contact info such as telephone number and email address. Winners will be announced in late April, 2010 so hurry and enter here today. There is still time! Also, if I’m not coming to your town during my tour in 2010, I can still attend your book club meeting. Simply Skype me in. If you are not familiar with video conferencing through Skype, click this link ( http://www.skype.com/ ) to find out more, join Skype then email me with the date of your book club meeting. 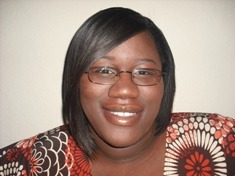 Dwan Abrams is a full-time novelist and freelance editor. She currently writes for Urban Books/Kensington. She’s the award-winning, best-selling author of My Mother’s Child, Married Strangers, Divorcing the Devil, Only True Love Waits, and The Scream Within. Her sixth novel will be released by Urban Books/Kensington in 2011. She’s the founder/facilitator of the Just Write! Workshop. Additionally, she’s the founder, publisher, and editorial director of Nevaeh Publishing, a small press independent publishing house. She was inducted into “Who’s Who” in Black Atlanta in 2006 and again in 2010. My relationship with God makes me powerful. BPM: Who are your mentors? I have some literary big sisters, namely Kendra Norman-Bellamy and Marissa Monteilh. Where do you find your inspiration? My inspiration comes from so many things. I’m inspired by fascinating people that I meet, my marital relationship, and close friends and family members too. My writing offers the following legacy to future readers…that I was here and I had something to say. BPM: Introduce us to your book and the main characters. 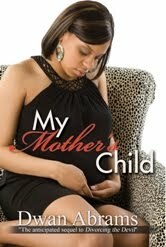 My Mother’s Child is the standalone sequel to Divorcing the Devil. Nigel Fredericks made his debut in Divorcing the Devil, and he will give readers insight into his psychotic world. Lyric Stokes has the misfortune of becoming the object of Nigel’s obsession. Lyric’s husband, Michael, finds himself going through great lengths to protect his family. Ultimately, someone pays with their life. BPM: Who were your favorites? My favorite character in My Mother’s Child was Lyric’s dad, Henry. I liked him because he took ownership of his past mistakes and changed his life. He also loved his daughter. Are your characters from the portrayal of real people? Not in this book. BPM: What specific situation prompted you to write your book? Divorcing the Devil prompted me to write My Mother’s Child. Readers wanted to know more about Nigel, so I gave them what they wanted. BPM: What are two major events taking place? Two major events in My Mother’s Child are Nigel stalking Lyric, and Lyric’s pregnancy. A whole lot of drama surrounds those events. I want to reach as many readers as possible. My Mother’s Child takes readers on a suspenseful journey that will have them wanting to flip to the end just so they can see how it’s all going to pan out. • Just because somebody seems nice doesn’t mean they are. • God will fight your battles if you let Him. • True love conquers all. • Everything that glitters isn’t gold. Lyric Stokes seems to have a charmed life, yet she’s unfulfilled. No matter what she has materially, it can’t fill the void inside of her. She has daddy issues that she hadn’t addressed, and to top it off, she’s having a hard time getting pregnant. My Mother’s Child will make readers believe that unconditional love does exist. Be careful what you ask for. And don’t ever lose faith. BPM: What do you think makes your book different from others in the same genre? The plot twist for sure. There’s nothing predictable about the story. Also, one of the topics isn’t something that a lot of people even knew was possible until recently. If there’s another fiction book that has addressed the topic, I haven’t heard about it. I’m conducting a workshop on quitting your day job at the 2010 Black Writers Reunion and Conference. I’ll be representing my publishing company, Nevaeh Publishing, at the 2010 Faith and Fiction Retreat pitch session. We have three books being released in April, including a children’s book. I’m also releasing an ebook on publishing. I’m all over the web. My author site is http://www.dwanabrams.com, and my publishing web site is http://www.nevaehpublishing.com. I’m also on Facebook and Twitter. My books are available wherever books are sold, including online at Amazon.com, bn.com, and Black Expressions. Folake Taylor, MD was born in the United Kingdom to Nigerian-born parents in the early 70s and was raised in both countries before settling in the United States to live the American dream. She is a 2006 graduate of the Internal Medicine Residency Program of the Morehouse School of Medicine in Atlanta, GA. Taylor obtained her initial medical degree from Nigeria. Taylor is a member of the American College of Physicians (ACP) and is board certified by the American Board of Internal Medicine (ABIM). She has always loved to write but never dreamt of actually writing a book. She would write sixteen page letters to her friends in boarding schools as a teenager which was always eagerly anticipated by the recipient and shared with those around! Perhaps being the daughter of a writer had something to do with it. Prior to her debut as an author, she had medical publications and conference presentations to her credit. Folake loves to have fun, especially with her favorite people, her husband and little girl. She loves to travel, loves water sports (though a non-swimmer) and she loves to read and watch great movies. Guess what else she loves? Go carts and Six Flags! She believes in making the world a better place, one person at a time, one good deed at a time. And she has faith that it is possible if only we try. She communicates this message as she debuts on the literary scene with “The Only Way is Up: The Journey of an Immigrant.” This is a book about empowerment and hope, especially but not exclusively for women. She hopes to embark on more writing projects in the future. Her website is http://www.theonlywayisup.net/ and she can be reached at ft@theonlywayisup.net. This book features the author’s experiences and views on pertinent life issues as an immigrant to the United States. The objective is to empower women though the greater part is of relevance to a general audience. The book provides insight and solutions for a variety of common issues in our society including issues with identity, weight, health, nutrition, finding a mate, relationships in general and gender roles. It also gives insight into borrowing from other cultures. Buy the book at Amazon today. BPM: Folake, what makes you powerful as a person and a writer? I would say my global exposure and my background as a medical doctor makes me powerful as a person with my message. As a writer, I would say the fact that I have written all my life and always gotten positive responses. I have always been able to capture people’s attention with my writing but I just never planned to do it on this scale. Also, my mother is a writer. She’s written 3 books, one of which was published by Africa World Press and was read in American Universities (Womanism and African Consciousness). It is still listed on amazon.com today. I must have inherited those genes! My parents most importantly, especially my mother who taught me to be a strong black woman but still keep a marriage and family together. They are still waxing strong. If anyone had told me twenty years ago I would someday name my mother as my mentor, I probably would have said, “Shoot me”! But we live and learn. I also admire Michelle Obama for what she represents for women in general but most especially the black woman, how she supports her man, how she stands by him and uplifts him. My writing offers the following legacy to future readers: Empowerment and family values. BPM: Introduce us to your book, The Only Way is Up. How does society, history or current affairs influence the story? The Only Way is Up is a book mainly about the restoration of family values. The book also gives a proper perspective on what our priorities should be in life. It manages to do this without being boring or judgmental. Though non-fiction, it is a fun and easy read that touches on both triumphs and personal failures as well as everyday events that we can relate to. It even has elements of humor scattered throughout; a reflection of my spirit, regardless of the surrounding circumstances. It of course also has information about other cultures, tolerance, continual self-reflection and introspection. It chronicles how I learnt from my mistakes–it does not tell you about a perfect life at all! Being well aware of the fact that people do not necessarily want to read a memoir about a previously unknown author except you just discovered the cure for AIDS or something like that, I did not set out to write a biography or memoir. It was however necessary to introduce me, who I am and what I do so the book does start off with that. I also often draw on my life experiences and upbringing in different parts of the book so as to draw a parallel and paint a picture of what could be if certain decisions and choices were made differently. In other parts of the book, I am purely expressing an opinion and linking to events around us that we can all relate to. I in no way just throw lists of things to do or not to do at you. It has been described to me as reading like a laid back conversation between friends about life. As a person who would not typically buy how-to or self help books, that exactly was my aim. I believe God gave me the inspiration, however. It came primarily from watching my husband and daughter interact which took me back in time to my relationship with my father and his role in my success as the man in my life from the beginning. Not to underestimate the value of a mother in one’s life which is not quantifiable but I believe a lack of understanding of the role of fathers in their children’s lives (both male and female alike) is responsible for many of the downward trends in our society now. Kids grow up without the balance from both parents and for the most part, both sexes. This was buttressed by a Larry King Live special titled Women & Self Worth: Defining One’s Self Could Be the Key to Complete Success. That was the magical moment. “I have a message,” I thought. It was literally like “Ding, dong!” I picked up my Blackberry and started to type…. Having a happy childhood that was full of love has a direct relationship to who I am today. I make the distinction between wealth that is superficial (material), and wealth of the mind and spirit in the book. It saddens me as I look around daily and realize certain life lessons I took for granted growing up were not taught to many and the so called “common sense” is actually quite uncommon. Being an MD, I frequently share these views with my patients. I just never dreamt I would be a published writer. I have always written for fun however. When I was young, I would write sixteen page letters to my friends in boarding schools and they would report back to me that they eagerly awaited my letters and read them with their peers. More recently, it was Facebook notes and the likes. My target audiences are women, African Americans and immigrants. That however does not preclude someone outside of those demographics from benefiting from the book as my readers have demonstrated. The message of hope is of relevance to a general audience. All the men I have heard feedback from have had a very positive response to the book. My reviewer from Midwest Book Review was actually a man. BPM: How will reading your book shape the readers’ lives? It will shape their lives by giving them the confidence to start to take control of their situation and stop feeling like victims of circumstances, regardless of their background or their past. The book communicates a can-do attitude. It’s about empowerment, hope, faith, possibilities and constantly improving ourselves in life, hence the title: The Only Way is Up. It paints a picture of just what we can achieve if we start by conceiving it in our minds and then taking action which ultimately brings about a change in our situation. It’s really more about an initial change in attitude which then translates to a renewed confidence and an eventual change in actions. It’s uphill from there. I think that’s different for everybody. For me, it was the parts of the book where I discuss my past failures, be it in relationships or otherwise. But it really depends on who is reading it I would say! I want them to feel empowered. I want them to feel they can do anything and everything because they can. I want them to take control of their situation and make things happen because they can. Yes we can! I believe these are mainly two things. I have not come across any self help book that addresses as many issues as I do in this book that is written by an immigrant. There are a lot of amazing self help books out there written by wonderful people but usually, there’s a 400 page book about dating, or a 300 page book about spirituality or another separate book about finance. Also, the books I have seen written by immigrants are mostly either a biography or fiction. What I have done is like a summary book so to speak. It’s about a change in attitude and perception. For that person that does not have the time or the resources to buy ten different books on each subject matter, my book is it. Another factor is the fact that I was born in the UK, raised in both the UK and Nigeria and have lived in the United States for 10 years. It gives me a global view; a view from within and without. Now, that’s priceless wouldn’t you say? Midwest Book review gave me 5 stars. I had a free book giveaway contest on Goodreads for a week (I just joined actually) and 616 people were interested. My signings are going well and the bookstore workers often make comments like, “I have never seen an author sell that many books in an hour.” This happened on a day after we had 3 inches of snow in Atlanta which meant most people never stepped out of their house! So yes, the response has been very positive and the challenge is getting the word out there about my book. I already know there is a huge market for my message. I just need to continue to strive to connect to my audience better. 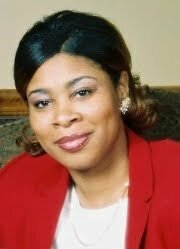 Tamika Newhouse is the award winning selling author of The Ultimate No No. She is also known as the creator and President of African Americans on the Move Book Club, which is an online book club catering to avid readers across the nation. She is currently the CEO of Delphine Publications and literary consultant. In March 2009 Tamika was announced the Women of the Year by Alive Magazine. She recently won Author of the Year with African American Literary Awards. 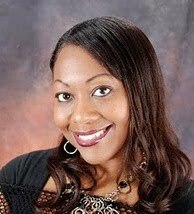 Tamika created the national tour group called Literary Sistah’s, where she and authors tour all over the nation. She is currently living in San Antonio with her husband son, and daughter and attends University of Texas. She is currently working on her third novel Cookie: A Fort Worth Story and plans to release her fourth novel He was a Bad Idea following Cookie. EDC: How did you get your start in the publishing industry? EDC: Did you have any formal business training? EDC: What separates you and your firm from the competition? I honestly didn’t know of any other format when I started my company. So the fact that I launched something clueless to the industry excites me. The ideas and concepts I started in which I continue to do all began when I knew nothing or no one. EDC: How would you describe your experience as a female entrepreneur? Being an entrepreneur is tough, time consuming, and adventurous. You take complete control and meet so many people. To think that I am here in this position is a blessing because I didn’t start to read novels until 2006. But I was always a writer since the day I could write a sentence. Being your own boss has its blessings and sometimes I find myself so obsessed over my work that I can’t stop. Ideas come one after the other. So I enjoy being an entrepreneur because I control my destiny. Well me and God that is. EDC: What do you like most about your profession? EDC: What is your biggest challenge in business? How did you overcome it? My biggest challenge is that with success come trials and tribulations. I am a fan of myself but somewhere down the road you meet others who are not. It can be because of what you do, what you’ve accomplished and so forth. I use that as my motivation. So how I overcome the negativity is to use it as my gas to keep it moving. A business such as any other industry requires tough skin so I put my game face and enjoy my work. EDC: What advice would you give someone just starting out in your industry? EDC: What do you hope to offer your clients or customers to shape their lives? EDC: What are 3 things all leaders possess? EDC: How does your mission or vision keep your business growing? EDC: Tell us about the people you help. How is your organization or company impacting the public? What social issues or causes do you want to address? EDC: What’s new in your company? AAMBC has become more active in virtual tours since last spring; our radio show has a consistent concept with on average two shows a week. We started annual events such as Holiday Book Bash, Valentine Showcases, Holiday Book Drive, College Scholarship Fund, April is our Poetry Month, and we have our annual conference which will make its home in Dallas starting in 2011. AAMBC Radio has a new co-host Anna Black who is also signed to my label Delphine Publications. I am constantly thinking and developing new concepts and online events for our members. I will never rest I know that for sure. Tinisha Nicole Johnson resides in Denver, Colorado with her family. Besides a career in writing, she also hosts political teleconferences. She began writing as a hobby at the age of eleven; mostly poetry, which in later years turned into short stories and then novels. Her debut novel, Searchable Whereabouts was released February 2008 by Xpress Yourself Publishing. 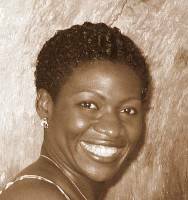 Tinisha also collaborated in the poetry anthology, Step Up To The Mic: A Poetic Explosion, which included some of HBO’s Def Poets and in the inspirational anthology Somebody Prayed For Me released December 2008, Xpress Yourself Publishing. In addition, her short story, “Mother and Son Moment,” was published in the Chicken Soup for the African American Soul. Her non-fiction, self-help title, Lessons Learned: Loving Yourself as a Black Woman was released in February 2010. Learn more about Tinisha and her books at her official web site. While you’re there, you can also sign up for her free newsletter: http://www.tinishanicolejohnson.com/. Tinisha Nicole Johnson was interviewed LIVE on Chicago’s major TV station WGN-TV on the Midday News. (Channel 9 in Chicago). 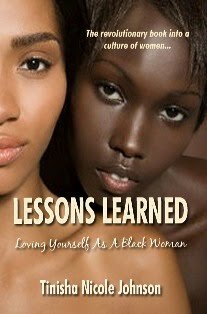 She discussed her non-fiction, self-help book Lessons Learned: Loving Yourself as a Black Woman. The book addresses ten life lessons into a woman’s most intimate and professional life. The book is being called “The Revolutional Book into a Culture of Women.” Although the book is catered towards black women, most any women can benefit from the tips and inspirational message the book conveys. Meet Adolphus Herndon, author of Five Thin Slices of Truth. Born and raised in northeast Texas, Adolphus Herndon spent many years of his adult life doing nothing but surviving day to day. Working mediocre jobs and reared in an environment where people thought a couple of dollars above minimum wage was “making it”, he wasted time doubting his abilities of becoming an author. When his frustration factor finally eclipsed his fear factor, he said a little prayer and started scribbling and scrabbling to fulfill his life-long passion. Five Thin Slices of Truth is his first published book. I love this question! What makes me powerful is my stubborn, persistent attitude. If any of my family and friends hear this, they would laugh and nod their heads in agreement. Also, my faith. True-to-life example: I am a new self–published author. Before I realize all the work that it takes to get published, I truly believe that my book will do very well. Now one may call that over confident, but I understand that in order for me to back those words up, I will have to be on my grind. To be totally honest, I have discovered that the real work was not the creation of my stories, (the editing, re-editing, rewriting, photo and cover designs, structure and organizing). No, no, no, the real work is the business side of getting it out to the masses. This means I will have to uncomfortably meet with media, attend events, and speak out to do all the PR and marketing that is totally essential for success. The bottom line, I believe all artists prefer to do their art more so than all the administrative, managing, accounting and all the pieces of business. Business is not the art, it is the necessity to continue the success of the art. Self-publishing is very fatiguing and cumbersome, however, I sometimes don’t realize it because I am so on fire, doing that which I actually like. BPM: Who are your mentors?This leads me to the second part of the question as to what makes me a powerful writer. Simply, I love to write good fiction and I like to image where in the world, time of day and type of persons actually reading my works of fiction. As of now and as an independent writer, I have more of a lee-way to write without much big-publication interference. Now I cannot say that will always be the case in the future. What makes me a powerful writer is my desire to write and the fact that I am motivated by readers who are tantalized for more of my talent. My mentors: My unofficial mentors are, Napoleon Hill’s Think and Grow Rich, Rhonda Byrne’s The Secret, and the legendary author, Walter Mosley. My writing offers the following legacy to future readers… insatiable and “edu-taining” fiction. 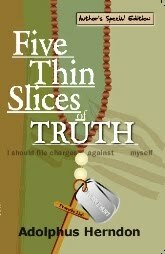 Five Thin Slices of Truth is not your typical novel because it is not a novel. It comprises three short stories plus two novellas. Each story is independent and exclusive but the entire project is spawned from controversial real-life issues dealing with sexuality, religious dogma and faith, psychotic behavior, self-denial, racism and patriotism. Of course since this is not a typical novel it would be unfair to say which of “my children” are my favorites. My sister and mother have read my book—and they are not avid readers period—anyway, throughout their readings they’d call me and ask if this situation of that character is real, or if it was me. I laugh it off because I believe all fictional stories derive from [to pun] “slices of truth” from all authors, whether that truth is direct, tanglible experience, or indirect. I must say that I have an extremely vivid imagination and have been blessed with the ability to grossly exaggerate a situation, an event, a news story, or even a phrase. For the sake of my book, Five Thin Slices of Truth, all my characters, situations and settings are by and large fiction. To write has always been a desire. I feel it has been a calling that I have been ignoring for years. I believe it was when I turned thirty that I practically woke up everyday asking myself, “Is today the day you will began to write?” Some years later after thirty, I went to the church at the time I was a member and I received my revelation. I was sitting in the pews amongst approximately 200 congregates, and I could almost swear the preacher was speaking directly to me. His sermon or teaching was about staying focused, conquering fears and fulfilling life destiny. He stated that too many Christians are satisfied with less and denying their God gifted talents, yet they are eewing and ahhing over people whom they believe are lucky and more fortunate. He broke it down and basically said, while most people would watch the idiot box for hours, run the streets, or gossiping, those who did not indulge in those unproductive behaviors became successful because they worked what God had placed inside of them, their gifts. Therefore, we are in awe of their results when it should be us. BPM: Take us inside the book, Five Thin Slices of Truth. When you crack open the book, I intentionally created stories that would make it difficult to put the book down. Instead of just two major events, the reader will journey into five different worlds dealing with sexuality, self-identity issues, spirituality and faith, racism and stereotypes and patriotism. All five stories are exclusive and independent. They have their own alphas and omegas. I created the stories based on situation that I desire to influence an outcome: Story 1, Me and My House: Upon the conclusion, one would have to question their own spirituality and religious commitment. Story 2, Before the Morning After: The bottom line is be yourself or else face the consequences. Story 3, The Rant of Roymon Bivens : The reader will interpret many different messages from this is story. However, the bottom line is don’t be quick to judge because the enemy can use those stereotypes to deceive the masses. Story 4, Purple Hurt: This novella has two messages. First, it is about patriotism and heroism from an unlikely person. Second, the don’t ask, don’t tell policy doesn’t matter. How ironic that I’d write a story and publish at a time where our President of these United States is working on a plan to repeal the policy. This story is chic and hot, and I really believe it is unique to the current political climate. Story 5, Angel on a Fire: This story is basically about doing for others results in the ultimate pleasure and satisfaction. To deny that fact means picking up bad habits, addictions and bad philosophies about life and people. People will either see themselves, someone they know, or both. Either way, they will enjoy it because it is in-your-face entertainment. Religious dogma and faith, self-denial and trying to play cards that have not been dealt to you, the desire to serve this great nation should not be limited based on sexual orientation, and there’s no reward in being self-centered behavior; and be careful when judging people. To be entertained and to understand that although the issues are based on slices of truth, please enjoy good fiction. For a debut publication, I have a compilation of various genres and subject matters: thrill and suspense, dark comedy, melo-drama all into various subject matters (sexuality, religious, identity, etc.). This is just published, approx. 3 months ago and I pray for its success and I pray for it to be nominated for awards. We have also released an eBook version of this book that can be read on a Kindle, PC, iPhone, and iPod touch. The eBook is titled Five Thin Slices of Truth: Kindle eBook Edition and is available at Amazon.com for only $9.95 compared to $14.95 for the print edition. Evelyn Coleman, the Edgar nominated, award winning author writes across genres from pictures books, young adult novels to adult thrillers. Her latest books, Freedom Train and the American Girl doll Addy’s new mystery, Shadows on Society Hill have garnered rave reviews. Visit “storylineonline.net” to watch James Earl Jones and Amber Rose Tamblyn reading her books, To Be a Drum & White Socks Only. Coleman is a former Georgia Author of the Year, Atlanta Mayor’s Fellow, Parent’s Choice Award and Carter G. Woodson Honoree and past President of Mystery Writers of America, SE and a member of International Thriller Writers. Hmmm the word “power” doesn’t always appeal to me because it implies other ideas I don’t much like but I prefer to think of myself as meaningful. As a writer I hope to bring energy to readers to accomplish things they dream of doing in their own lives. To understand that change is going to happen whether you do what you want or not, so you have nothing to lose when you take chances. My mother, my deceased father, my daughters….my granddaughter and grandson, many, many “play” sisters and brothers have all mentored who I am. My writing offers the following legacy to future readers… to look behind closed doors, to think deeply about your environment, to take nothing at face value and to know your own path. BPM: Introduce us to your book, What a Woman’s Gotta Do, and the main characters. What a Woman’s Gotta Do — Trying to find out why her man did her wrong and who did him in, this woman isn’t waiting to exhale–she’s ready to fight back. Patricia Conley considers herself to be a brother’s worst nightmare. A lifetime of hurt has made her fierce. A lifetime of victories has made her proud. And a whole lot of hope keeps her going. Now Patricia’s most daring stab at happiness has come up bad: The man she was supposed to marry has stood her up. Last seen holding hands with another woman, Kenneth Lawson has vanished. Still reeling from Kenneth’s disappearance, Patricia is stunned by a series of macabre discoveries. Her car is found bathed in blood. A woman is found dead. And another too-good-to-be-true brother is offering his services. Suddenly the tough-talking Atlanta journalist doesn’t know who to trust. Because in a collision of murder, religion, love, and race, Patricia has learned some extraordinary secrets–some about Kenneth Lawson, a few about herself, and one that the whole world needs to know. BPM: Who were your favorites in What a Woman’s Gotta Do? All the characters appealed to me in one way or the other. Are your characters from the portrayal of real people? No, not really, they are all made up, of course, they are similar composites of people that I have known in my life on some level reflected in this story. I have always loved “espionage thrillers” and that has been the books I read the most but when it came time to write my own book it seemed everyone was in love with Terry McMillan’s style…. (not to infer that this was her only style) so I sat out to mimic that style. When I gave it to one of my best friends and readers Pat Carr, she scoffed. “You are so far from Terry McMillan – sorry but you have penned another thriller type story.” At first I was sad that I couldn’t do the more popular type book, but then I shrugged and begin to just write what I know…. Espionage type thriller books. Patricia Conley, a journalist doesn’t believe in love or marriage so when she falls for her live-in lover and accepts a proposal of marriage, she is as surprised as her friends… But on her wedding day, her lover stands her up and is spotted shortly after in a restaurant holding hands with a woman…. This begins the spiral of betrayal, mystery and adventure for Patricia as she tries to unravel all the obstacles to find her man. The second major event is her going to the monastery. I want to reach all people who love a good thriller. One of the best compliments I received was from a dissatisfied reader on Amazon. I paraphrase here but essentially she complained that the book moved too fast, too many twist and turns and you don’t find out what is the problem until the end of the book. Duh. Hopefully it will open minds to all the scientific experiments and discoveries that are taking place under the radar, ones that will ultimately affect their lives. How science affects our daily existence. How much the Dogon in Africa contributed to our understanding of the world. And how important it is to pay attention to not only what you do but what others you don’t know do as well. Hmm. I suspect the last chapter because until that chapter I doubt you can guess the full ramifications of the events of the book and how they could change the world. Insight, inquisitiveness, thoughtful reading habits and a better understanding of martial arts and the Dogon of West Africa. There are no other thrillers on this subject. In fact when I contacted Marcel Griaule’s daughter Genevieve (both French anthropologists who studied the Dogon extensively) she cried, stating she had been waiting all her life for an African American to take more interest in the Dogon. Of course, she meant popular interest I’m sure as there were already a few African American scholars who studied the Dogon. And one of the happiest moments of my career was to hear from a Dogon scholar who said I truly “nailed” the Dogon in this book and their cosmogony. I am pondering what to write next. I have to have a subject matter that is not widely known, intriguing and has the potential to affect the world at large. It has been over ten years since I wrote What a Woman’s Gotta Do and I still hear from readers asking me when I am writing another book. All I can say is when the time is ready the story will come….I sure hope it’s soon though. My latest book, The Freedom Train is available in bookstores. Get your copy today! Also pick up, Shadows on Society Hill, American Girl, Addy’s new mystery….nominated for an Edgar Award. 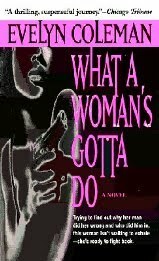 What a Woman’s Gotta Do, my adult thriller, is still available at http://www.randomhouse.com/. White Socks Only, To Be a Drum and the Riches of Oseola McCarty all are also availabe. Also check out my friends Angela Benson, Angela Medearis, Nancy Tolson, Linda Trice, Eleanora Tate, Irene Smalls & Margaret Johnson Hodge’s books. Looking for a storyteller try LaDoris Bias Davis at ladorisstoryexpress.com. If you get a chance pass on the word about my granddaughter’s group and visit Vistoso Bosses. For artwork or opportunties for wonderful music played/guitar and original songs, see Sankofa (my daughter). One more thing, check out my jewelry Ekstasi Designs and my friend’s jewelry at Lady Lucia Designs. Need something for your hair Saniyyah Naturally provides the best hair care ever. Want something manufactured…. Atlanta Sewing and Patternmaking Service.